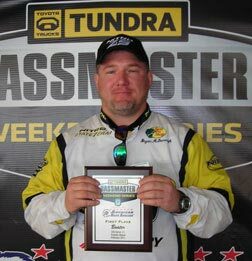 Battling freezing temperatures, Bryan McDonough won the Toyota Tundra Bassmaster Weekend Series, operated by American Bass Anglers, Louisiana Division 13 tournament, held Feb. 12, 2011, on Toledo Bend Reservoir. Running out of Cypress Bend Park in Many, the 37-year-old angler from Katy, Texas, landed five bass weighing 20.09 pounds with a 5.40-pound kicker. McDonough went home about $2,500 richer. The anglers could fish anywhere in the 186,000-acre lake straddling the Louisiana-Texas line along the Sabine River. "I've been on these fish for about three weeks in the snow and ice," McDonough said. "I've been catching them by slow-rolling red Rat-L-Traps in the grass. I caught three right off the bat. I caught about 10 all day. They were all about the same size." In second for the event, Glen Freeman, 60, of Converse, La., landed a five-bass tournament limit weighing 19.66 pounds. He caught 15 bass to pocket $1,279. "I fished as far north as I could," Freeman said. "I tried to stay ahead of the muddy water. I stayed on break lines like ditches, drains, creeks, any kind of channel with cover and fished a black and blue jig. The better fish were in deeper water. I lost one good fish that might have helped put me over." In third for the Boater Division, Pete Lowe, 47, of Woodworth, La., landed five bass going 18.97 pounds, including one 6.76-pounder. For the effort, he earned $853. "I found some fish about two weeks earlier, but the cold weather moved in and they backed off," Lowe said. "I only had one area, but they were stacked in there. I caught the fish cranking a Spro lipless crankbait in a crawfish pattern. As the day warmed up, fishing actually got worse. I was in some grass and ripping the bait out. I lost about a 4-pounder." In fourth for the boaters, John Burns of Gautier, Miss., landed three bass at 18.78 pounds, but anchored his stringer with a 9-pounder that took tournament lunker honors. 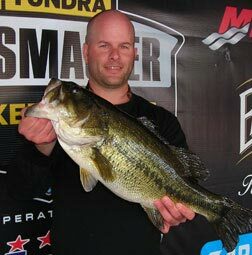 Dusty Wood of Keithville, La., placed fifth with five bass going 17.83 pounds. Fishing only his second bass tournament in his life, Matthew Bates, 36, of Pineville, La., continued his fantastic start to his fishing career by winning his second ABA BWS event in three weeks as a co-angler. Fishing with McDonough, he caught three bass weighing 15.02 pounds and also took the Co-Angler Division big bass title with an 8.86-pounder. For the effort, Bates picked up more than $1,400 in income. "We knew going into this tournament that we would have to use Rat-L-Traps," Bates said. "I caught all five of my fish on a red Rat-L-Trap. I worked it as slow as I could near the grass. I just got lucky to get another good draw for a boater." On Jan. 22, Bates won his first ABA BWS event on the Atchafalaya Basin, his first bass tournament ever. He also took big bass honors in the Atchafalaya Basin tournament. In second for the co-anglers, Steve Meche of Pineville, La., landed three bass for 14.52 pounds, followed by Tommy Fay of Belle Chasse, La., with three bass going 11.63 pounds with a 4.47-pound kicker. Charles Glorioso of Thibodaux, La., caught three bass going 11.14 pounds. Tate Orgeron of Houma, La., took fifth with three bass weighing 10.03 pounds. For more information, call ABA at (888) 203-6222. On line, see www.americanbassanglers.com.